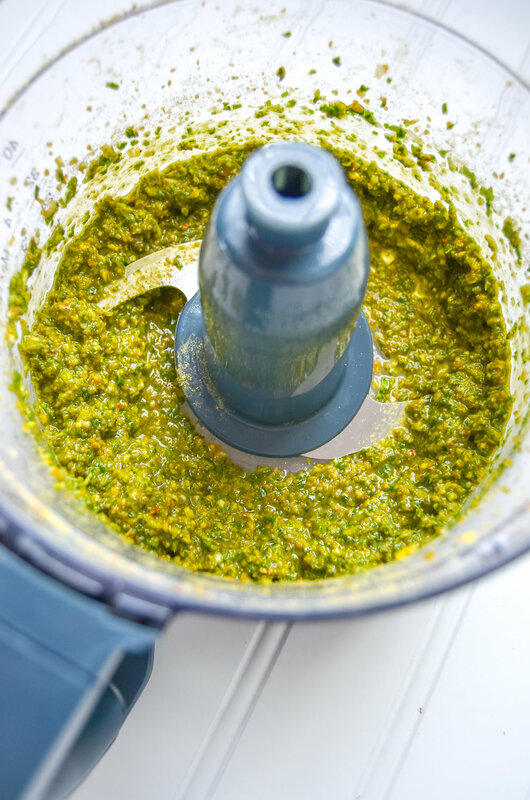 This vegan pesto will soon become a fridge staple as it uses 5-ingredients in less than 5 minutes! Pesto has got to be my most favorite sauce of all time! But unfortunately, since I am lactose intolerant, it can be very hard finding a vegan version of pesto in grocery stores and in most restaurants since parmesan plays a major role in the sauce. Well, what do I do?! What can I do to resolve this issue!? You will probably have most of these ingredients on hand except maybe nutritional yeast. For my vegan and vegetarian subscribers, I know it can be hard to incorporate vitamin B12 into your diet, and often plant-based eaters end up deficient since B12 occurs naturally in animal foods. Nutritional yeast is a great way to get your daily recommended amount of vitamin B12! See source for more information. 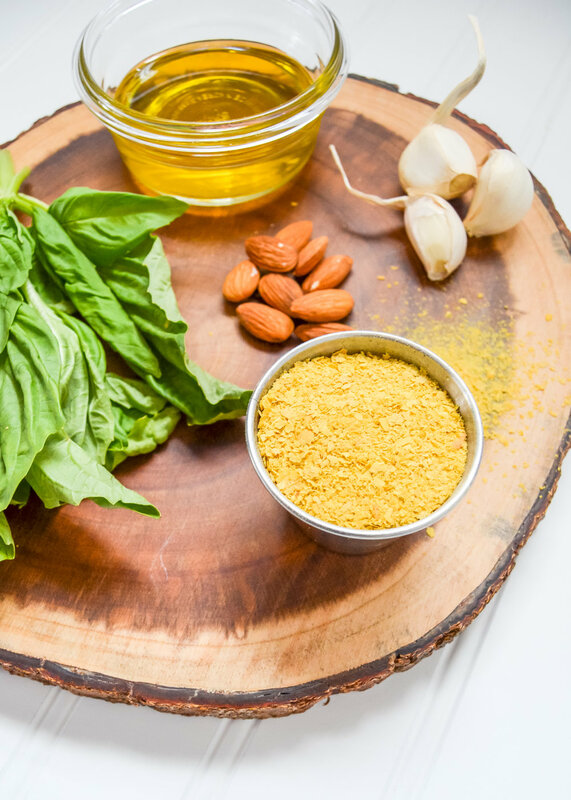 Adding nutritional yeast will not only help with vitamin B12 but will also give the pesto a “cheesy” flavor. 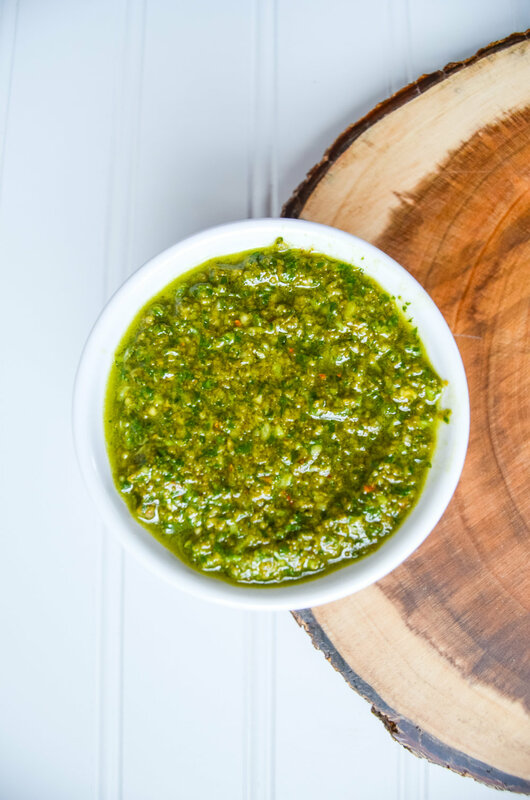 Pesto is a great everyday sauce that can be used in many dishes such as pasta, appetizers, chicken and/or potatoes. Pesto is great in the fridge for up to a week or stored in the freezer (in an airtight container) for up to 1 month. One of my favorite things to do is to pour pesto sauce into an ice tray. All you need to do is heat up a skillet, pop out a pesto cube or two, and let it melt! Add chicken breasts or tempeh to the skillet and you will have a very simple and easy side dish! In a food processor, pulse almonds and garlic until finely chopped. Add basil, yeast, and S/P on high until loose paste forms. Taste and adjust if necessary, adding more nutritional yeast for that cheesy flavor, salt for overall flavor, garlic for that “bite” or almonds for a nuttier flavor. Best stored in the fridge for up to one week or freezer for up to 1 month.